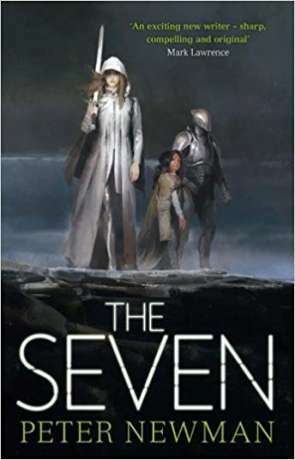 The Seven is Peter Newman's stunning conclusion to the post-apocalyptic Vagrant Trilogy, following on from the events of The Vagrant and The Malice. A number of years have passed since the Vagrant journeyed to the Shining City with a baby Vesper and Gamma's sword. Following in her fathers footsteps some time later, Vesper closed the tear between worlds, protecting humanity but also trapping the Infernal Horde. Vesper now works towards unity and with it peace and for a time things look hopeful for the future. That is until the Seven awaken and once more set their immortal feet upon the world. When I first encountered Newman's work in 2015 I was blown away by the mature, confident and clever writing. The backdrop of a bleak, twisted world compliments and helps to set the series apart. Each of the last two years Newman's work has been amongst the best I've encountered. The Seven is no exception. Awakening the Seven really ups the scale of the story, dealing with immortal beings of immense power, beings that are treated as gods. Thankfully we also get some insight into just how the Seven arose, with the author periodically dropping back some few thousand years. I liked these small breaks in the story. The main story does of course largely involve the Seven, with Alpha leading the charge to purge those who are "tainted" while Vesper, The Vagrant supporting cast do their very best to stop the bloodshed. It's a gripping story that doesn't let up. In part it's a lesson on the problems and unforseen circumstances inherent in changing the world for the better - a dialogue on what happens after the big climactic finale. Vesper changed the world by sealing the tear (in The Malice) but that means the Infernal Horde are trapped in the world too. It also means that Alpha going on a rampage to "purge the taint" becomes are more serious issue than it would have been otherwise. It's a clever and thoughtful plot, while also maintaining that scifi grimdark edge that helps to define the series. I wouldn't approach The Seven if you haven't read the previous two books, the story will still make sense but you will miss out on a great deal. That said Newman continues to build and evolve his characters through the book, as he has all along this journey. I would however recommend this book and the series to anyone and everyone, its bold, intelligent and creative fiction with a great story and even greater cast - absolutely fantastic. Written on 25th April 2017 by Ant.